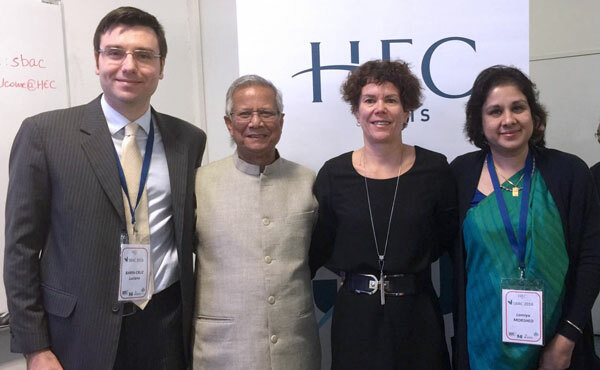 HEC Montréal and its IDEOS centre have agreed with the Yunus Centre to set up a Yunus Social Business Centre, the first of its kind in Canada. The new centre will be inspired by the philosophy of Bangladeshi economist Muhammad Yunus, who founded the Grameen microfinancing bank and won the Nobel Peace Prize in 2006. One of the objectives of the centre, directed by Associate Professor Luciano Barin Cruz (Management), will be to work with Canadian firms on developing projects with a social impact. “The goal is to have large Canadian companies contribute their expertise to socially innovative projects,” explains Professor Barin Cruz, citing the association between the Grameen Bank and Danone as an example. The two organizations joined forces to create low-cost yoghurt for Bangladesh, as a way of fighting childhood malnutrition. An 80-gram portion of one of these fortified yoghurts provides 30% of a child’s daily vitamin A, zinc and iodine needs. The new Centre is in line with IDEOS’ goals of working on different forms of social organizations. IDEOS develops applied research, training, coaching and knowledge transfer projects in order to improve the management and governance of social or community-based companies and organizations. Photo : Luciano Barin Cruz (Co-Director of the Pôle IDEOS, Director of the future Yunus Social Business Centre and Associate Professor at HEC Montréal), Muhammad Yunus (President of the Yunus Centre et Nobel Peace Prize 2006), Johanne Turbide (Co-Director of the Pôle IDEOS, Director of the Sustainable Campus and Full Professor at HEC Montréal), Lamiya Morshed (Executive Director of the Yunus Centre).